Gordon Logan has always thought that he and his fellow guitar players were different somehow. As a psychologist at Vanderbilt University, he set out to prove it. Through a set of experiments, Logan, Nashville musician Jerry Kimbrough and Matthew Crump (now of Brooklyn College-CUNY) have illustrated that guitarists – and players of other related instruments like mandolin, banjo and bass – tend to acquire their skills differently than most other musicians. 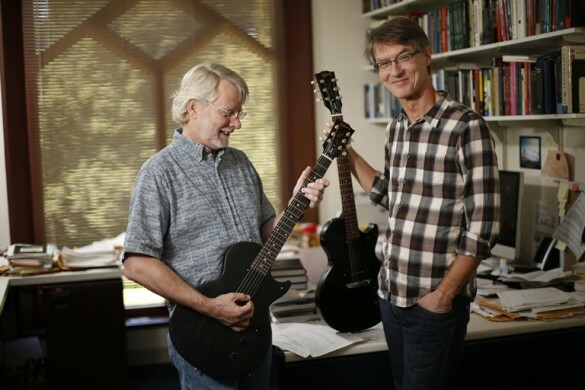 “Guitar players learn on the street, compared to musicians such as piano players,” said Logan, Centennial Professor of Psychology at Vanderbilt and an expert on how people acquire skills. Though many aspiring guitarists have started out learning and using music notation like brass players or pianists, Logan and quite a few others taught themselves by watching other guitarists and copying them. To test their theory, Logan, Crump and Kimbrough performed a series of tests. The results were published in the September issue of Music Perception, published by University of California Press. “What we wanted to do was marry standard techniques of cognitive psychology with the guitar,” Logan said. First, they took pictures of Logan playing various chords on the guitar, made diagrams of the musical denotation of chords and also letters that denote chords. Then they tested how fast guitarists could either say or play the chords based on these cues. “We found out that letters cue the fastest responses compared to diagrams and pictures,” Logan said. Unlike with the other cues, responses to the picture version of chords were faster or slower depending on how the picture was rotated, showing that guitarists are faster to recognize chords from familiar viewpoints, like when they are watching themselves or another guitarist play a chord. For another test, the researchers showed subjects pictures of chords while at the same time playing a chord – sometimes the correct chord and sometimes not. When the wrong chord was played, guitar players were fooled by the photograph, while non-musicians were not. “The point of that was that the guitarists were influenced by the visual representation of the chords, and they couldn’t turn it off,” Logan said. Reading music is harder for guitarists because any given note on the guitar can be played on different strings of the instrument. So simply knowing what note to play isn’t enough information for guitarists; they need to know the most efficient way to play the note in the context of the piece of music they’re playing. “There’s also the reality that guitarists playing popular music usually need to display a bit of showmanship, which is much easier to do without having to keep your eyes glued to a music stand,” Logan said. “The fact that guitar players don’t read music too often frees up their eyes so they can look at their hands,” he said. “When you play piano or violin, you are trained not to look at your hands.